Callaway Competition has changed the livery on its epic-sounding and badass-looking Corvette GT3 after three years. The team’s Valvoline livery has been tossed out in favor of a colorful new black, white and blue look for 2019, with the team appearing to have no title sponsors this year. The Valvoline backing is gone, but the team has lined up some other small sponsors, including German Corvette dealer Autohaus Kramm in Berlin. 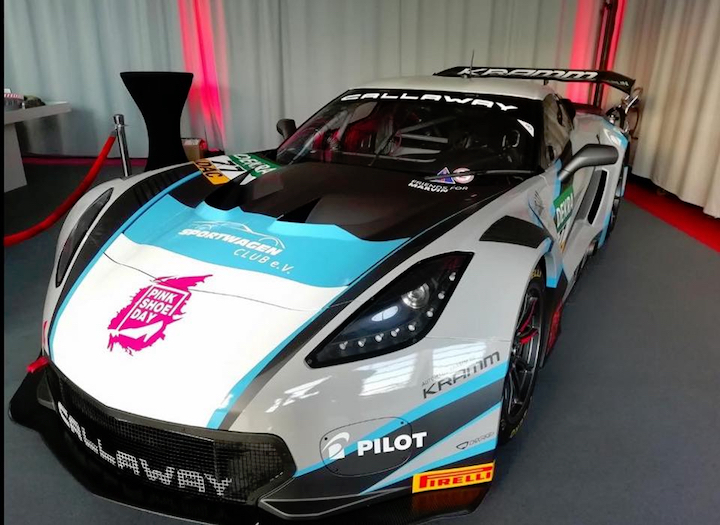 In fact, if you happen to be a German Corvette fan, the new-look Callaway Competition Corvette GT3 will be on display in the Corvette showroom at Autohaus Kramm from now until the start of the 2019 ADAC GT Masters season and the display is open to the public. The Leingarten, Germany-based Callaway Competition team is going into its 13th season in the ADAC GT Masters series and is the longest-serving and most successful team in the championship. The team developed its Corvette GT3 in-house and so far racked up nine victories with the Chevrolet Small Block-powered GT3 car. It also took them to the ADAC team and driver championships in 2017. The Corvette GT3 was unveiled back in 2015 and is powered by a 6.2-liter V8 engine making somewhere in the ballpark of 600 hp. The engine sends power to the rear wheels through an X-Trac 6-speed sequential transmission with paddle shifters – not so different than the Corvette C7.R of Corvette Racing. “As a small, privately owned team, we knew from the outset that approaching a project of this magnitude would be very daring,” Ernst Wöhr and Giovanni Ciccone, managing partners of Callaway Competition, said following the Corvette GT3’s debut. Their investment has clearly paid off, with the C7 GT3 bringing the team continued success in recent years. The 2018 ADAC GT Masters champions were Mathieu Jaminet and Robert Renauer, who piloted a Porsche 911 R GT3 to the championship after taking four podiums. Callaway Competition racked up three wins in 2018 and finished the championship third. One of the problems with any Corvette racing program has is that the lessons learned in racing goes no where as it’s not like Mercedes and Ferrari where lessons learned on the track find their way to the production cars.. as the 2019 Chevrolet Corvette has changed little since it was first introduced.